1. Anything to help so the charges can be dropped or dismissed or even a lighter charge. 3 . Is it okay to use the case number in any spell or candle work, if yes, how? 1. Anything to help so the charges can be dropped or dismissed or even a lighter charge.- Yes, three are 5 pages here on this thread of great advice! 3 . Is it okay to use the case number in any spell or candle work, if yes, how?-See above! Hello all, I can't login to my original account after a couple years of trying...my original name is angel4decale. My son was arrested for home invasion last week. It's a lot of funny business going on with this scenario. First of all I will not lie and say I'm certain he had no part in it because I'm not with him 24/7 and I've learned a long time ago about putting too much faith in anyone... But I will say things aren't adding up here is what I mean. When this happened during last year's holiday season. The detectives called my cellphone as well as my husband's (it was so strange they had both our numbers and when we asked how did you get both our numbers they gave a couple different reasons they got them and finally said well we're the police.) moving on... they asked if they could search our house because one of my sons friends had stolen his mother's credit or debit card and went on a 30k shopping spree. And the same parents saw one of his other friends trying to break in their home so they needed to see if anything was stored here although they had a bunch of young men on camera with the boy shopping my son wasn't with them that weekend when they went shopping. They also asked me not to wake my son up until they came. we cooperated with them. They came and of course didn't find anything. So they took my son down to the bureau that day for questioning... They said they wanted information on his friend. and released him an hour later. The people who had the attempted invasion repeatedly said they saw my sons friend (they would know who they saw especially looking in the eye as these boys would be there almost daily with the son). The twist to this is... The detective working the case is good friends with the mother of the boy they saw and she and my family are friendly too. I haven't called her yet about this and not planning on it because her son is free even after threatening the woman via text messages (I saw the text his mom showed me before the police got the warrant for the phone) while my son sits in jail because of a fingerprint to a house he visited almost daily and the people originally stated he wasn't there. Now supposedly the son said he was the one that broke in after he was arrested when there isn't even any evidence that child was even arrested. I'm so confused as to what's going on and cannot afford the bail or an attorney to look into this at the least. Please give me some guidance. Every scenario I have ever come here (and there have been quite a few) with has worked one way or another... But always in my favor so I know I'm in the right place. Thanks in advance. Welcome back to the Lucky Mojo forum. I'm sorry to hear you are dealing with all this hardship. If you go to this page about Court Case products, there is a step-by-step guide on what to do if you or someone you know has been arrested. You could also put the arresting officer or whoever has power over your son's fate in this matter in a sweetening jar with your son, to sweeten that person to your son. Thank you Sister Jean. I'm going to it now. Forgive me if I am posting to the wrong forum. I am a little confused as how to post but I need help desperately. I have met someone who is incarcerated and I feel strongly the need to be with this person and to help them. I ask that all judegement is kept to yourself I am an adult and I know what path I want to take with this relationship. The issue is he is serving a 100 year to life sentence. I am willing to spend what I have to and put in the time needed to get this sentence overturned and get him home to me. I need help bigtime! I need to know where to even start. He has 3 strikes. He knows a great appeal attorney who has helped him on a prior case but that attorney is expensive. So i need info on getting his sentence reduced or overturned or getting him paroled. I also need info on money work to get the money and work that I need to pay the lawyer or drawing business to my little home business. I am going to order Sumac berries as I have been reading the forum but I really need a plan of attack before I order. I just want to get the right spellkits from LM and I know that this is a very complicated case. I would like to get the appeal attorney on our side as well so that he gets him released. I think I should also do a little love work to make sure things stay stable between us when he is released? Please any guidance is greatly welcomed as I don't even know where to start. Welcome to the Lucky Mojo forum. We wouldn't judge you here, I just hope you approach this situation with realistic expectations. A prison sentence of 100 years to life is quite serious. 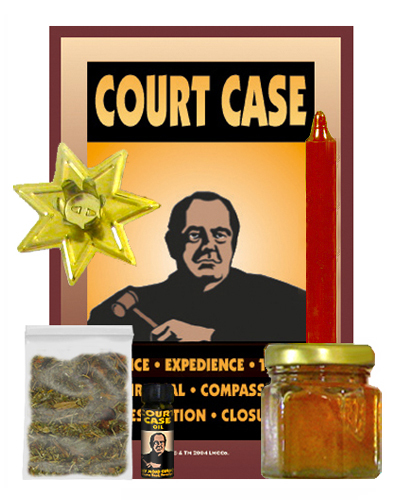 If you want to get the lawyer on your side, you could sweeten this person by using a honey jar, and that sort of work is explained on that Court Case page as well. P.S. If you scroll up through this thread, you'll also find lots more spell ideas. I have a subrogation claim against me by someone’s insurance company for over 100k for something I didn’t do. Apparently the insurance company has to blame someone after they payout the damages and since I was just there in the house I am getting blamed for damages even though I was actually in the shower. It’s honestly completely ridiculous. The police report officially says Any damages to the home were accidental and there wasn’t no at fault party. While this should be an open and shut case, I want to be on the safe side because insurance companies are notoriously nefarious and sketchy in their attacking against innocent parties. I’m hiring a lawyer to take care of this for me as it is on my credit report. My goal is to have the subrogation claim removed and for this ridiculous charge taken off of my credit report permanently. I’m wondering if there are any LMCC products recommended for this particular type of case? There is no court date as I have not been served, this is just a subrogation claim my lawyer is hoping to remove. Have you already read the 5 pages on this thread for spell ideas? I am so sorry that this happened and it is absolutely terrible. Hello I need help I want to know if there is any way I can have a court case dismissed that has already concluded without further court proceedings. I am currently on parole and the whole case has really messed up my life. I plead innocent throughout the whole thing and still do. I fought on appeal and lost. The courts were never made fair to begin with but now I have a lady who wants to help me but asks what is my petition. I don’t know how to word it to her so the I can get my case dismissed and my life back. I have proved my innocence through legal evidence as well as lie detection. Can the case be overturned? And how do I petition for it? Thanks so much Sister Jean I do have litigation in the courts and I have a hearing on my parole conditions coming soon in a few weeks, nothing to overturn the case though. I also need to attract a very powerful lawyer to help for free. I paid a guy that told me that he would cast spell to completely set me free from the case and that was one month ago and he told me to wait for the results. I’m not sure what happened to a post I made that was waiting on approval however here is the post and if I somehow duplicated the post my apologies in advance! A friend of mine is being accused of a shooting they say they did not commit. I hear that a woman he was dealing with of Middle Eastern decent may have done some sorcery on him and even put a DJINN on him but I can’t say with 100% certainty however my friend seems to think that this was in fact the case! I read about both Honey and Vinegar Jars and wanted to start one of each however after reading and reading through both threads I did not find the answer I sought, so let me elaborate and hopefully someone can help! For the honey jar I have the following herbs that I plan on adding to the jar Calamus, Claendula, Cascara Sagrada Powder, Celandine, Cinnamon, Deerstongue, Devil Shoe String, Dill Seeds, Licorice Root, Little John (Galangal) Slippery Elm, Sumac Berries, Tandy, Tobacco, Palo Santo and Palo Cambia Voz. Elderflower and Fennel Seeds are on my list but not sure if there is a magical number of herbs that can be added. I also have Law Keep Away, Conqueror and Court Case oil that I plan to use. And I also have egg shell powder that I thought would be a good one to throw in there for protection. As for the vinegar jar I have the following herbs to add to the jar, Asafoetida, Cloves, Black Mustard Seeds, Poppy Seeds, Pepper – Black, Cayanne, Red Flakes, 1 Whole Habanero and 1 Whole Birds Eye Rusted Nails Sulfur War water, glass shards some dog and cat poop along with Do as I say and Dominating oil. Where the uncertainty comes in is who to place in which jar. So here are my questions…. Who goes in Honey Jar??? 1. I know I want the judge, his lawyer and the jury in the honey jar but I’m not sure if I should add the prosecution, the investigators and the witnesses for the prosecution into this jar or the vinegar jar or both. Because I do want the prosecution to see this maybe a setup, and I want the witnesses to say nothing but nice things about my friend! 2. If I don’t have pictures can I add printed images such as a picture printed on regular copy paper? If I don’t have pictures or printed images will a name paper suffice? In the end my goal is to get him to walk away from this untouched I’m also trying to make it so that if he walks he is not deported, so with that said should I include INS to these jars as well or create another jar for that? Sorry for the long post!!!! I am in need of some guidance. My husband was a passenger in a drunk driving accident that killed his friend in 2016. This past fall in 2017 they have arrested my husband, charging him with driving, with 11 counts and 'if he was not driving, responsible for the death by allowing his friend to drive." My husband was not the driver and unfortunately lost his friend. We have a jury trial beginning this April. We have purchased the Court Case spell and waiting to perform 9 days prior. We have petitioned St. Anthony for a miracle, performed honey jar spell and I am planning to perform a beef tongue today. Ask you to guide me in any other spells to perform to help us. Especially to give our attorneys power in the court room. Please scroll up through this thread and read the other posts; you'll find lots of helpful information. If you need help after that, we are here for you. Thank you all for your guidance. I have also been looking for a spell for the prosecution and police to lose/ misplace their evidence. Even though they don’t have much. I am not having success finding exactly what I need. Guidance for this type of spell is asked of you all. I need urgent help, my lawyer just called me today and told me that I would be having a court hearing this Friday, I don't have time to prepare. What should I do? I need this motion granted. I need the judge to side with me. Welcome to the Lucky Mojo forum. I'm so sorry to hear about this accident and the death of your cousin. Welcome to the Lucky Mojo forum. I'm very sorry to hear about the trouble you and your family are going through. Hi: Can someone give advice on what needs to be done. I am in some trouble. I have never been in trouble a day in my life and I have a 5 yr old. I got in to a dispute with some people that I thought were my friends which caused them to do all kinds of things to get me into trouble. Now I am having to go to court and if found guilty I could lose my kid, my job, and everything, because this is considered a felony. 1. I prepared a beef tongue for this court case. Since the beef tongue was prepared, the court date has bern rescheduled. Should I do another beef tongue since it was rescheduled or is the one that I have in the freezer good enough. 2. I have never done a candle spell before. What all can I do or is there someone here that can do spells for me to assist in this.Is there anything else I could do to help me get Victory out of this case. Hello, IVY_13 and welcome to the Lucky Mojo Forum. If you think that you may have done something of what you are accused of,or that incontrovertible physical evidence against you may come out that will lead to a conviction and your only hope will be a reduced sentence (for instance, a community service or drug diversion program or traffic court kind of sentence, as opposed to hard jail or prison time) i want you to add Sumac Berries to all of your work -- any spell you do. Sumac Berries are for "mercy of the court" and if a person cannot get off, because the evidence against him or her is strong,it is the custom to do a Sumac Berry spell between the conviction and the sentencing -- but i have been working cases like this a long time and i find that it is easier, and just as effective to add the Sumac Berries from in front, as a kind of "as-if-i-were-to-be-convicted" insurance. Your worker or adviser cannot decide this for you. Do not even speak your choice to buy them or not in this Forum. Just either add them or don't. Search your own heart. You do not need to declare anything here in the Forum -- and i would rather that you did NOT compromise your case in any way. 1) Keep using the same tongue. Just keep praying on it and if you want to add Sumac Berries, do it. Next, i recommend using a honey jar as a base on which to burn 4" candles. In the honey jar you will put the names of all who can help you -- your lawyer, the judge, favourable witnesses, and character reference witnesses. As time comes closer for court, you will want to get Little John To Chew Root for the trial, if the charges do not get dropped. The brown candles we got in our last big order do indeed look orangey-brown, but they are different from the orange ones (which are bright orange). We've used them for years and they work just fine. Hello, my name is veve I got stop at Walmart for shoplifting (I had my daughter with me and she was distracting me at the self checkout) so I ended up forgetting to pay for some of the stuff in my shopping bag. I now have a case and need to go to court, I'm nervous and scared, can you please help me, I don't want to have any records Bc of something stupid.. please is there something you can guide me toward working on, or is there something I can do on my ends to help? I'm a mother who is trying to survive on whatever I got at the moment which is not a lot, please help me. I plan on getting a lawyer but I don't want the officer to show up to court, what can I do for that to happen and for the case to be drop or inmy favor? Please help as soon as possible. I am sorry to hear about the situation you are currently in. Hoodoo has many spells that are good for court cases. I have used the LM court case spell kit with success. I also have a friend who had two felonies removed (expunged ) from his record using the LM court case sachet powder. Remember when using it, to make a very clear petition, try writing it out several times till you find the perfect one. Not too long but concise. There are multiple spells I would use during this time to support the outcome you desire. A mojo, using candles, chewing little john chew, tongue freezer spell, and honey jar. The mojo is to be worn to give you success in court, little john chew is chewed on while in court to win, tongue freezer spell will freeze out the tongue of those speaking against you, a honey jar will give you favor with your lawyer and the judge. Wear the condition oil on your body as well and wear crown of success on your head. Dust any court papers with the sachet powders. Since you did sin by technically stealing (even if an accident), I would start with a bath in hyssop while you recite Psalms 51 asking God to forgive your accidental sin. I would order extra candles to have at home and dress them while working in this case, also to place on the honey jar mon-wed-fri.
What if I want to do the ammonia jar spell on my shoplifting case, (on the previous comment ^) how could I word my petition? For an ammonia jar, you word your petition as the opposite of whatever it is that you want to have happen. Do you have any spells to get out legal trouble when you are culpable. I had good intentions but went about it the wrong way. So I am trying to get some dismissed and won. AceJay thank you for your response. So I went down the list and put together the spells, but I don't see anything to help my attorney specifically. To make sure is prepared and on point and convincing etc. She previous effed up royally so I gotta make sure. You can dress a purple candle in these oils and burn it on her photo or business card. You can add some Deer's Tongue to the candle, to encourage her to speak convincingly in court. Lightly anoint your hands in these oils when you are going to see her and shake her hand to get it on her. You should also visit the forum threads on Court Case spells to find other ideas to succeed with your case. Do a little search on the forum using the search bar in the upper right corner and you will be led to the right section of the board. Welcome to the forum! We're glad to have you here. I am sorry your girlfriend is in such trouble. The thread you are posting in has five pages full of spell advice for getting charged dropped or reduced, so please read through them for ideas. Whether this will succeed for your girlfriend is up to spirit, but you risk nothing by trying. I would also include Master Key Products when fixing your key for this ritual - "MASTER KEY SPELLS TO FIX AND DRESS A KEY"
I have also had success using these two Psalms to get a person out of jail and charges dropped: Psalms 67 to release those in prison, Psalms 71 to release from prison to get an acquittal. Both Psalms can be prayed over baths, candle work, mojos etc.